An adventure like no other awaits you in October of 2015. With just 30 guests, we’ll circumnavigate the world on a remarkable journey in a spacious luxury private jet. The aircraft that normally carries 124 passengers is reconfigured for our intimate group of 30 guests only; delight in the services of the onboard chef and select crew, and relax with premium wines and beverages. From the time you arrive in Seattle on October 6th and meet your traveling companions and Lakani private jet tour managers – until you touch down in Boston on October 28th you’ll experience unrivaled service and amenities and gather untold memories. 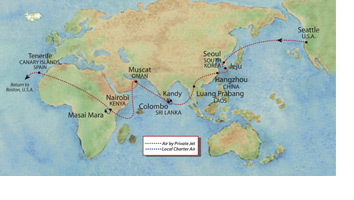 During our Around the World journey, you will witness captivating sights in Seoul, Jeju Island, Hangzhou, Luang Prabang, Kandy, Muscat, Masai Mara, and Canary Islands. Learn about their diverse cultures and discover the bonds that tie us all together. Luxuriate in splendid and exclusive accommodations, like Richard Branson’s Mahali Mzuri Safari Camp in Masai Mara, and enjoy exquisite dining all along the way. Personalize your experience with the Lakani “Choose your Day” and “Dine by Choice” flexibility. It’s an experience not to be missed! Book and deposit your clients on this October 2015 departure by March 31st, 2015 and receive $5,000 per couple off the journey price. Ask for details. This offer is not combinable with any other offers, valid on new bookings only. Visit www.lakani.com to view the brochure online. Call Lakani World Tours at 888.565.5554 for more information or to reserve your client’s seats.